Jadeveon Clowney is thought to be the best overall talent of this year’s NFL Draft, but the Houston Texans are still deciding whether or not to use the No. 1 pick on the former South Carolina defensive star because of their glaring need at the quarterback position. While Blake Bortles, Johnny Manziel and Teddy Bridgewater are enticing to take with the top pick, Clowney might have an answer where the Texans can get the best of both worlds. 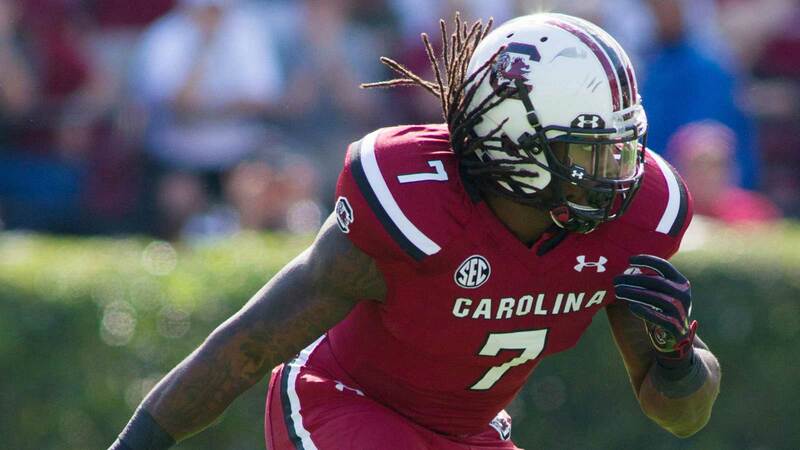 "I can play every position on the field" Clowney told ESPN after his pro day on Wednesday. "Whatever they want me to play, I can be good at it." While the thought of a 6-foot-6, 266-pound Clowney playing quarterback makes for a good laugh, the Texans are very intrigued by his athleticism which could allow him to convert to playing outside linebacker. "I can pretty much do it all," Clowney said. "Anything on defense I can help. I can be a playmaker. I am a playmaker. I’ve got what it takes, I believe to go out there and set the tone for the next guy coming up. And to help my team out winning games." Another plus in Clowney’s favor is that teams he has starts playing for win games after his arrival. "Every team I’ve ever played with, we’ve never had a losing season. Never," Clowney said. "Before I got there [South Carolina], I watched them lose. Not just here. Back in high school, middle school. I was like, ‘Man, that ain’t going to be my team when I play on that team.’"
The Gamecocks were 11-2 in each of Clowney’s three seasons at South Carolina, having never won more than 10 games in a season before he arrived. Texans head coach Bill O’Brien believes he can have that type of impact in Houston if the team chooses to draft him after going 2-14 last season. "Any time you’ve got a guy that has that kind of height, weight and speed ratio with the explosiveness, the instincts, the football instincts that he has, he’s a guy that can impact a football game," O’Brien said. "Any time you’re drafting in the first round, you look for impact players and he certainly is that type of player." The Texans are planning on bringing Clowney to Houston to visit the team facilities later in the month, but the team maintains the competition to be the top pick is far from over. "Wide open," O’Brien said. "They moved the draft back two weeks, so we’ve got plenty of time."